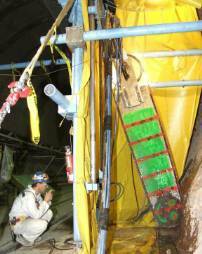 The pressurized slot testing provides in situ mechanical properties of the rock. At the selected test locations, the rib surface is instrumented to monitor deformations, and two vertical slots will be cut in the rib to create a "tendon" of rock between them. Flatjacks and bearing plates are placed in the slots, which are instrumented to measure displacement across the slot. During the initial flatjack pressurization, the pressure at which the deformation of the rock cancels the deformation due to slot cutting can be used to estimate the in situ stress acting normal to the slots. Subsequent loading-unloading cycles provide a pressure/deformation history that is evaluated to determine the rock mass deformation modulus. Additional information can be obtained by including a borehole in the center of the tendon between the slots and measuring the deformation across the borehole diameter as the slots are loaded. As the pressures in the flatjacks increase, the stress around the borehole will also increase, possibly resulting in failure of the rock. The failure stress of the rock can then be determined from the borehole observations. Finally, the rock mass strength can be evaluated by increasing the flatjack pressure until gross failure of the tendon of rock between the flatjacks occurs. Because this test is conducted in a complex configuration, numerical modeling of the test is required during both test design and for post-test analyses of the results. ISRM Commission on Testing Method, Suggested Method for Deformability Determination Using a Large Flat Jack Technique, Int. J. Rock Mech. Min. Sci. & Geomech. Abstr. Vol. 23, No. 2, pp. 131-140, 1986. Zimmerman, R.M. et. 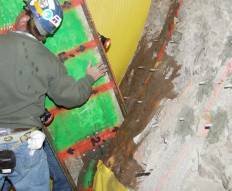 al., G-Tunnel Pressurized Slot-Testing Evaluations, SAND87-2778, Sandia National Laboratories, Albuquerque, NM. Zimmerman, R.M. Et Al., G-Tunnel Pressurized Slot-Testing Data Summary, SAND88-0586, Sandia National Laboratories, Albuquerque, NM. Rocha, M. et. Al, A New Technique for Applying the Method of the Flat Jack in the Determination of Stresses Inside Rock Mass, Proc. 1st Cong. ISRM (Lisbon), Vol. 2, pp. 57-65, 1966.